This article is about the man-eating fish from Super Mario Bros. 3. For the similar enemy also known as Boss Bass in Yoshi's Island DS, see Cheep Chomp. "Big Bertha" redirects here. For information about the character from the Super Mario Bros. film, see Big Bertha (film character). For the Blaster from Super Mario RPG: Legend of the Seven Stars, see Big Bertha (Blaster). A Boss Bass is a giant Cheep Cheep that often patrols the surface of the water. It is also found underwater, where it is called Big Bertha. Boss Basses and Big Berthas are the original "giant" counterpart to the jumping and swimming Cheep Cheeps, respectively, though this role is currently held by Big Cheep Cheep, which is only found swimming in most platforming games. Their voracious nature is given to Cheep Chomp, another occasional giant counterpart to Cheep Cheeps, which was redesigned to resemble Boss Bass in Super Mario 64 DS and even has the same behavior and English name as Boss Bass in Yoshi's Island DS. In Super Mario Bros. 3, the Boss Bass swims on the surface of the water trying to leap out and eat Mario if he gets too close. It defeats Mario instantly in one gulp regardless of his form, even if he is a statue. In both of the stages it appears in, the water level rises and sinks, making Mario an easy target. Throwing blocks, shells, hammers, and fireballs at the Boss Bass can defeat it, as well as tail attacks and using a Starman, but it eventually comes back. However, in Super Mario Advance 4: Super Mario Bros. 3, if the player has turned on the e-Reader card that makes enemies hit by fireballs turn into coins, and the player successfully hits the Boss Bass with a fireball and collects the coin, the Boss Bass does not return for the rest of the level. The passive Big Bertha is found swimming back and forth underwater, carrying Baby Cheeps in their mouth, and occasionally letting them out. After a few seconds, the baby returns to its parent's mouth. A Boss Bass from "Never Koop a Koopa". Boss Basses make appearances in The Adventures of Super Mario Bros. 3, where they usually chase after Mario and his friends. Bertha, a character influenced by the Big Bertha species, plays a prominent role in two Nintendo Comics System stories. In her first appearance, Love Flounders, she falls in love with Frog Mario after being tricked by Stanley the Talking Fish. She eventually realizes Stanley was lying, but is consoled by Mario, who states he wants to be friends with Bertha, not lovers. Bertha later reappears in Fins and Roses, this time dating Stanley. She foils Wendy O. Koopa's plans by knocking the Koopa's bomb back at her. 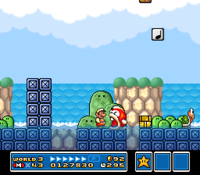 In the second mode of Mario Teaches Typing, Underwater World, the game repeatedly loops footage of Mario, Luigi or Princess Toadstool swimming away from either a Boss Bass or a Blooper. Their appearance is slightly different: their fins are cyan, they have several sharp teeth rather than a single blunt tooth, and have round pupils with eyebrows instead of squinting pupils. In Super Paper Mario, Boss Basses do not appear but are given two passing mentions in the English script. In The Underwhere, a Shayde tells another one of three stories about how he lost a life. The second story involves him falling into the sea from a pipe, but instead of drowning, he can apparently swim as well as a Cheep Cheep. However, a Boss Bass thought that since he swam like a fish, he was one himself, and the huge fish ate him. In the Japanese version, a shark is mentioned instead. The other mention of a Boss Bass is via the 77th Sammer Guy Ripper Van Fish, who mentions counting Boss Basses to sleep if spoken to after defeat. ↑ "Even if Mario is Super, Boss Bass, the terror of the high seas, can swallow him whole." - Nintendo Power Volume 13, page 8. ↑ 「水面を移動し、ジャンプして襲いかかってくる。水中にいることもある。」 (Moving along the water surface, it jumps to attack. It also exists underwater.) - Shogakukan. 2015. Super Mario Bros. Hyakka: Nintendo Kōshiki Guidebook, Super Mario Bros. 3 section, page 36. 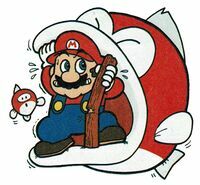 ↑ "This giant fish is a mouth breeder, so it spits babies out of its mouth at Mario." - Nintendo Power Volume 13, page 9. This page was last edited on April 5, 2019, at 09:38.